With the World Cup 2010 in South Africa well underway the talk has been less about the technical aspects of say, the Italian game, the powerhouse Germans or England’s dismal failure to despatch their adversaries from the United States, but rather about the Vuvuzela, the South African trumpet-like instrument which is dominating football debate currently. 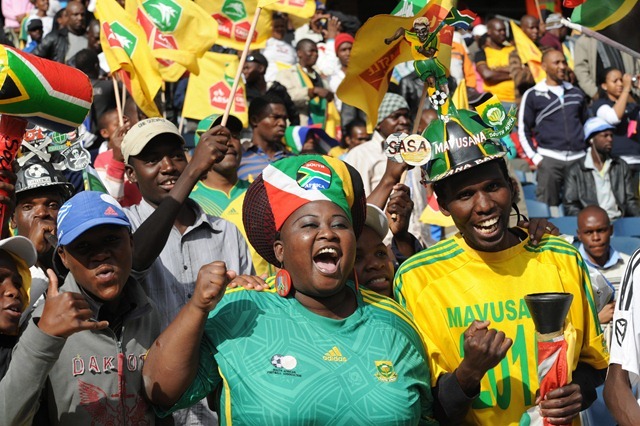 The vuvuzela is around a metre in length, made of plastic, usually brightly coloured and sounds singularly like an elephant and collectively, in their thousands in the magnificent South African stadiums, like a great swarm of angry bees. Apparently the vuvuzela has come to symbolise sport in that country. Being a regular visitor to one or two football websites, (Hibernian FC) I’ve read several debates about the vuvuzela and its effect on the World Cup and in a totally unscientific assessment I’d say that around 90% of fans seems to be against them. Personally I’m no great lover of the sound, any more than I was the constant ringing air-horns of the European games of my youth in the seventies (now there’s an irony) but I really don’t understand the lack of tolerance towards the vuvuzela. Granted, they tend to be more than a mite intrusive on one’s viewing of the World Cup games but I think that like most things, with enough exposure one gets used to the drone after a short time. Talking of drones, I really think the vuvuzela is an improvement on the likes of ‘colour man’, Mick McCarthy’s constant, miserable harping on about the current game in progress and a good few of his colleagues and contemporaries from both major TV channels. I think though, there is a point being missed here. The World Cup of football (and the summer Olympics equally) are a fabulous showcase for the countries fortunate enough to be chosen to host them. Not too long ago only Europe and South America, alternately, were allowed to host the World Cup, no other continents being deemed worthy or indeed trustworthy. The complexion of the great game has changed however and I think with that we have to accept different ways and different customs. The African continent, represented by the Rainbow Nation in 2010 is showing us a totally different and new face for football and its future. For many years we have been informed that one of the previously dismissed and underrated African countries will win a World Cup. This hasn’t even nearly happened but what does appear to be occurring is that the lovely, simple game of football is spreading far and wide over that continent in its popularity. The die has been set and the game will certainly go from strength to strength in Africa in the coming years. I’ll restate that I’m not particularly a fan of the vuvuzela but then again I’m not either a fan of some of the moronic-sounding and simplistic chanting that passes for singing in UK football grounds these days. It all depends on your customs really as to what you might think is acceptable or entertaining. What I would really like to see here regarding the vuvuzelas is just a little tolerance for other people’s differences. What is evident from the vivid and animated scenes being relayed back to us from South Africa is that the people there are having a wonderful time, the whole atmosphere surrounding South Africa 2010 is one of joy, celebration and a welcoming to the whole world. That is human emotion and the crossing of cultural boundaries that we rarely see elsewhere except in the field of sport. Let’s not let a petty debate about a metre-long plastic trumpet spoil all that. Traditionally, sections of the South African people have had music, and singing in particular, that took hard-pressed people through the tough times of apartheid. They learned to express themselves in this way and that is a thing of beauty. The vuvuzela cannot be compared with that but I still say ‘let the people play’. Vuvuzelas are so nosy that makes all the atmosphere on the public disappear. There is only a constant noise. No songs, no rummors, nothing. The public makes the sport but this is not the case if all you can hear is vuvuzelas. I watch the games with the sound off cause I found them really annoying. You can find on websapce a lot of articles from funny to sad, pro and contra vuvuzelas.